The new Force ATM Machine (NH2800SE) is the proud new addition to the family of world-class retail machines from Hyosung. Also offers an improved UL 291 business hours safe for added protection - an EMV card reader and a PCI 3.0 compliant keypad. The Force ATM is also positioned to support cardless cash withdrawals using an optional NFC (Near Field Communications) feature. The Force ATM succeeds the HALO II models, delivering the same quality and reliability you expect from industry leader Hyosung. The Force ATM offers a unique, sleek design perfect for locations ranging from small convenience stores to high-end retail ATM locations. Eye-catching, customizable color LED lighting around the keypad attracts more users to drive additional transactions and revenue to your bottom line. The Nautilus Hyosung intuitive application interface is presented on a vivid 12.1-inch LCD screen, and all user touch points (screen interface, keypad and cash exit) are positioned for optimal visibility and access. Nautilus Hyosung continues to lead the industry in reliability and ease of service. The Force ATM uses proven cash dispensing technology engineered for maximum uptime, widely regarded as the best in the industry. 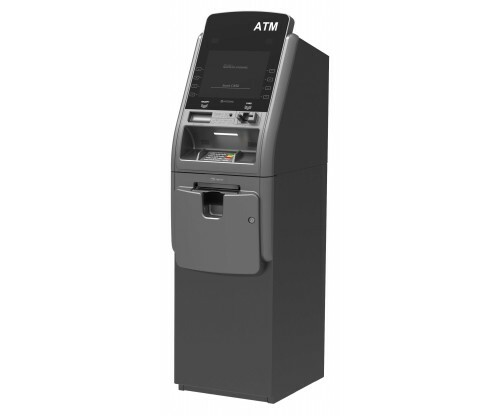 The Force ATM provides a highly intuitive operator menu program that enables first-time and veteran users to easily operate and service the machine. It incorporates Nautilus Hyosung modular component architecture designed for high reliability, quick service and maximum accessibility. TheForce ATM is equipped with energy-saving, long-lasting features and parts designed to minimize environmental impact. The system uses components compatible with other Nautilus Hyosung retail models, allowing customers to protect their investments in interchangeable spare parts. ATM users also have the paper-saving option of no receipt or screen display of a QR-encoded digital receipt. The Force ATM utilizes the Nautilus Hyosung enhanced retail application, which enables customers to earn additional revenue from transactions such as Dynamic Currency Conversion (DCC), donations, lottery and decimal surcharge. The system is also positioned to support cardless cash withdrawals using an optional NFC reader (Near Field Communications) feature, an attractive option to users transitioning to cardless transactions.